So…there is already a zucchini muffin recipe here on the blog that is healthier and absolutely delicious. However, it’s not flourless, so naturally there was a need for another zucchini muffin recipe. Right? Right! I wasn’t sure I was convinced there was a need for another zucchini muffin recipe, but when an awesome reader emailed me and asked for a gluten-free version of zucchini muffins, I knew it was time to start experimenting! My sister is gluten-intolerant and loves when I make treats that she can eat. Especially when those treats taste great too. 🙂 These muffins are packed with good-for-you ingredients and gluten free so long as you ensure your oats are certified gluten-free. I’ve also made these with dried currants which are definitely on par with the dark chocolate addition in these muffins. If you are a fan of dried currants + zucchini you are going to love the combo. Other healthy ingredients include Greek yogurt (vanilla flavored is the best in these! ), coconut oil, and a mashed banana. The riper the banana the better these are! In experimentation developing this recipe, I wanted to use as little sugar as possible while still keeping a great flavor. I also tried using honey as part of the sweetener. I preferred the batches without honey and found that about 6 tablespoons of lightly packed brown sugar was the perfect sweetness. That said, if you are a big fan of honey in muffins you could try doing using honey and some brown sugar. You could also try using maple syrup or agave nectar to replace some of the sugar. P.S. I almost forgot; Happy 1st day of July!! Preheat the oven to 350 degrees F. Grease 12 cavities of a muffin tin and set aside. In a bowl, stir together the oat flour (measured AFTER blending. I used regular old fashioned or quick oats and quickly pulse them in a blender or food processor until they resemble flour. Then measure and add to the bowl), cinnamon, baking powder, baking soda, and salt. 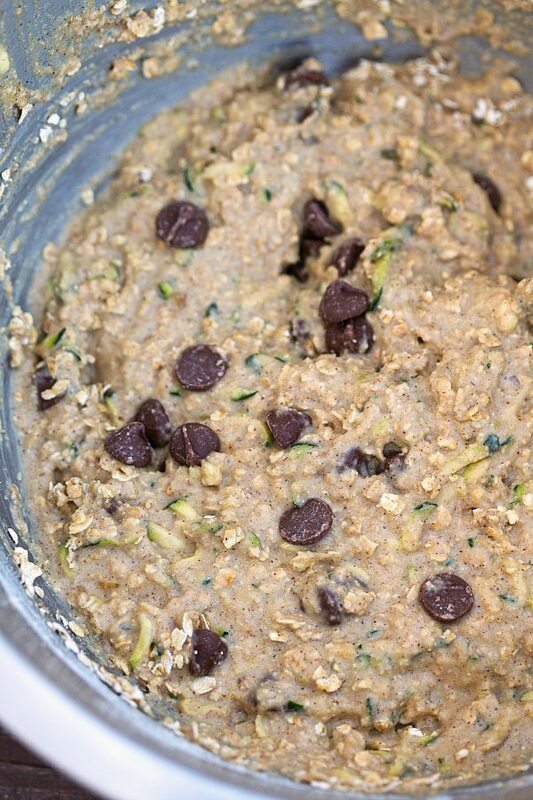 In another bowl, stir together the egg, vanilla extract, grated zucchini (make sure you have thoroughly dried the zucchini to keep it from being too wet/watery in the finished muffins), yogurt, coconut oil, mashed banana (very important for binding and sweetening), and brown sugar. Mix until well combined. Combine the wet and dry ingredients and mix until just combined. Over mixing will yield denser muffins. Stir in the dried currants or dark chocolate chips if desired. Fill up all 12 cavities evenly and bake for 16-18 minutes. Remove and allow the muffins to cool. Muffins are best eaten in 1-2 days. Store muffins in an airtight container in the fridge and warm up in the microwave for 10 seconds before enjoying. *If you are used to healthier desserts/snacks you can reduce the amount to taste preferences. You could also try adding honey, agave nectar, maple syrup although my favorite versions were with just brown sugar. Alternatively, if you are NOT used to healthier snacks, you may want to increase the brown sugar 1-3 tablespoons. I’m always impressed when I see muffins and cookies without flour. These look amazing, Chelsea! I love that you just used brown sugar to sweeten them. Sounds like the perfect, healthy muffin! Pinned! I don’t use nearly enough zucchini in my actual baking! I always forget that it’s delicious as more than just a veggie side, covered with cheese 😉 These healthy muffins sound like breakfast! Pinned! Wow, these don’t look healthy at all and I mean that in a good way! So craving one now! I just made these, but I forgot to add in the greek yogurt! It must be a mistake in the directions. They still taste good, but I think the consistency is a little off. I just love baked goods with zucchini! These muffins look fantastic Chelsea! These look moist and delicious and studded with melty chocolate! Can’t believe they’re SO healthy. 🙂 Pinning! Chelsea this looks SO good- Making it next week for sure! Yum! Gorgeous photos Chelsea. Zucchini tends to release a lot of water when I cook with it – did you find that? Did you pat the zucchini dry before including it? Or does the liquid actually help in this case? I love how healthy these are. Pinned! These healthy muffins look amazing, Chelsea! I love the pretty zucchini pieces poking out. The dark chocolate, Greek yogurt and coconut oil sound perfect in here! So healthy and delicious! Chelsea, these look YUMMY and love that they are healthier! I love baking with oats, coconut oil and of course dark chocolate. Need to try these! Pinned. Although, these muffins failed me… They turned out a bit too gooey and also they sank in the centre. Would you have any idea where I went wrong? So happy to hear! I’m sorry these muffins didn’t turn out quite how you were hoping though 🙁 They are quite moist due to the ingredients in them, but shouldn’t be gooey. Here are some thoughts: first, I think yours may have been under-baked so you may have needed to bake them longer (oven temperatures vary from home to home and it sounds like yours didn’t get baked all the way), next, perhaps try drying out your zucchini more to eliminate any extra moisture, third make sure your baking soda and powder are fresh and not too old (I refresh mine every couple of months), and finally, you may want to add a little bit more oat flour if you do try these again. Hopefully if you give these another go they will exceed your expectations! We have been loving them at my home! I made a few changes though. 1. I bought new baking powder and baking soda; and now store them in my refrigerator. 2. I squeezed the zucchini twice to rid it of its water. 3. I reduced the quantity of the greek yogurt because I made my own and feel the consistency might be different from the one you must be buying. I love using oat flour for muffins. It gives the best texture. These look amazing! Can you use applesauce instead of bananas in this recipe? Chelsea oh my gosh these are so good! 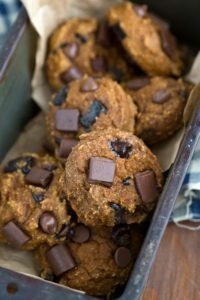 Just made these with truvia instead of brown sugar and they are awesome! I love your recipes! That is so great to hear!! I love to hear how you’ve changed them up with the different fruits 🙂 Thank you! These look great and I can’t wait to try them out! I was wondering if I could substitute the coconut oil with something else though? My boyfriend does not like coconut unfortunately and can pick it up in anything I put it in. Can I use butter or another type of oil such as sunflower? If so, could you please recommend quantities if you know? Thanks! Hey Gaby, I haven’t tried any other substitutions so I can’t say for sure without further recipe testing. I do think canola oil would be the best substitution. I made these and they rock! I have 4 picky eaters, and I’l always doing crazy acrobatics to get them to eat their vegetables. This is just too easy! My husband and I couldn’t stop eating the raw dough- so delicious! I came home from the store to find that half of my zucchini I had intended to use had gone bad, so I improvised… I added finely shredded carrots and in an act of desperation added one stalk of celery. You would NEVER know. Seriously- these muffins are like a chocolate chip salad at this point! I can not wait to smirk knowingly at my children as they wax eloquent about how good these “desserts” are. I can’t wait to try your other recipes. This one hit it out of the park! Hi Jennifer! Thank you so much for your sweet comment and for giving these a try! I love that you were able to sneak in all those other veggies 🙂 Thanks again and I hope you love what you try next! Do you have the nutrition info for these? They look great!! recommendations instead of banana? don’t have any on hand….